In February-March sorghum was given the stage in many countries. 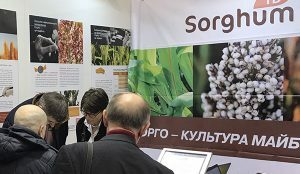 Study trip to France, conference in Spain, conferences and trade show in Ukraine … In February and March sorghum mobilized producers and processors on all terrains. In France, Sorghum ID presented the different potential uses of sorghum in animal feed to Russian and Ukrainian partners. – The presentation devoted to the French production of seeds (maize and sorghum) enabled them to understand the specific advantages of seeds produced in France. 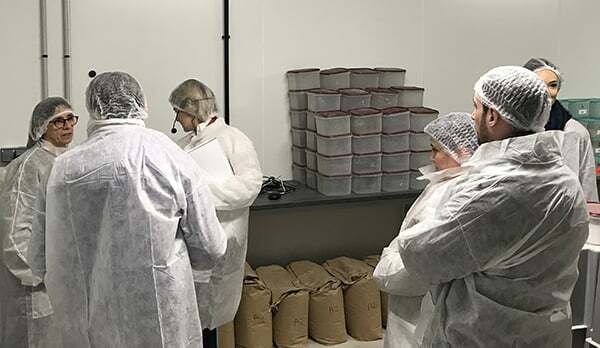 – During the visit of the Arvalis technical institute, they discovered comparative tests on poultry and pigs, with different raw materials including sorghum. – At the Granéo trading company, which collects sorghum in Touraine in central France, exchanges focused on the various outlets, and on drying and sorting techniques. – On a farm, the advantages of silage sorghum in addition to maize silage were developed. – The study trip ended with the visit of the company Idena, a service-provider and producer of feed for livestock. Participants found the program rewarding and diverse enough to capture the many strengths and potential uses of sorghum. In Spain, Sorghum ID spoke to 200 farmers during a conference. 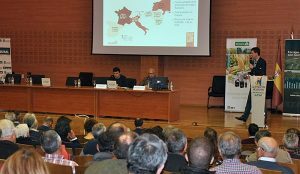 The audience was numerous on March 20, in the region of Benavente, proof that sorghum – which is still little known to the average Spanish farmer – creates a lot of interest. It is true that Spain produces little sorghum (30,000 tonnes or 10 times less than France) on about 6,500 ha, while it consumes a lot of sorghum in animal feed especially for pigs. As a result, Spain imports about 350,000 tonnes of sorghum each year and sometimes even more (500,000 tonnes in 2017). France, with 100,000 tons (or 1/3 of its production), is a major supplier. Other suppliers are mainly Ukraine and Russia. This year, a new player appeared on the market: the United States, which sold to Spain 250,000 tons of sorghum initially destined for China, and whose delivery was cancelled because of the trade war waged by both countries. Fortunately, this had no impact on French sorghum exports since at the end of January, 65,000T were exported, the highest level in 3 years, so there is still room for French sorghum in Spain. The conference of March 20 strengthened the links between Spanish and French producers and allowed Sorghum ID to present its objectives and, more generally, sorghum as a crop. In Ukraine, 2 conferences and an exhibition were led by the FNPSMS and Sorghum ID. The annual Agro Animal Show is one of the largest agricultural exhibitions in Ukraine. This unmissable meeting of Ukrainian agriculture took place in Kiev from 19 to 21 February. Sorghum ID held a stand to present the inter-branch organisation, production techniques as well as the different outlets offered by sorghum to farmers. In Ukraine, sorghum is grown on 45,000 ha, so the potential for development is high, especially in the south of the country where the weather can be very dry in summer with almost non-existent irrigation. As part of the Agro Animal Show, a conference was held on the optimal use of sorghum in animal feed. The following program was presented: the different types of sorghum silage and their uses to feed cattle by Hugues Chauveau, Arvalis Plant Institute engineer, and the advantages of incorporating sorghum into poultry and pig formulations by Charles-Antoine Courtois of Sorghum ID. Seed and Advisory companies, members of Sorghum ID, presented the different hybrid varieties available in Ukraine. The second conference was organized by Business France as part of the “French Day”. Anna Kolakowska of the FNPSMS presented the assets of French seed production of maize and sorghum. The high-performance genetics, the quality and the regularity of French production were highlighted.